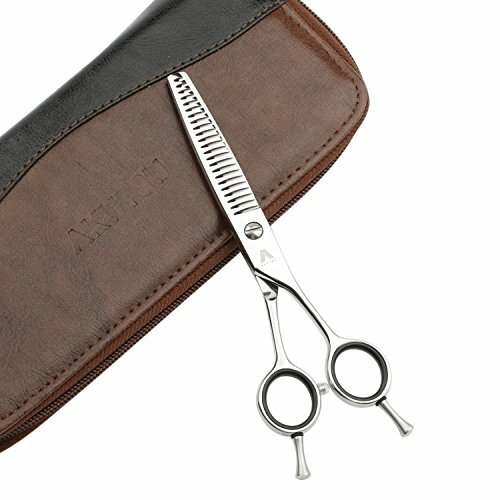 STYLE- 6.0 inch thinning scissors, desigh for both right hand and left hand. 100% satisfaction guarantee: Your Satisfaction is Our Unremitting Pursuit. First, Each pair of scissors will be checked several times before we pack it up. Second, All of our orders will be sent by Amazon to avoid logistics problems. Third, If anything goes wrong, Amazon would offer you the best solution. 1,Try to avoid cutting the air. 2,Only used for hair cutting. 3,Clean up in time and put on lubricant oil if necessary. 4,Handle with care and do not throw. 5,Do not cut dry hair or thick hair at beginning. 6,Be careful and keep it away from children. Hand made by experienced craftsman. No dragging or pulling hair when texturizing ,sharp convex edge gives the scissor a smooth and quiet run. Made of 9CR13 stainless steel, makes the scissors sharpened and durable using for much longer time,the scissor often feels and cuts better than when it was new. Double finger rests design, suits both for right and left handed stylist,tension screw was adjusted to the best position, you could also adjust the tension by yourself if necessory. Including 2pcs high quality carbon fiber combs and a cleaning cloth. If you have any questions about this product by AKUTSU, contact us by completing and submitting the form below. If you are looking for a specif part number, please include it with your message.